Firestarter arose from research Stephen King had been doing into psychic phenomena, specifically, pyrokinesis. He read about spontaneous human combustion and other bizarre incidents. In one case that he has mentioned on several occasions, a boy started to burn while the family was at the beach. His father dunked him in the water, but he kept on burning and died from his injuries, with his father sustaining serious burns on his arms. King has admitted to a fascination with fire, referring back to one of his favorite characters, Trashcan Man from The Stand, who loves to start fires, the bigger the better. King wanted to explore what might happen to a person who had the ability to start fires with his or her mind and could control it. When he reached the shootout scene at Manders’ farm, he gave up on the book because he was afraid he was simply writing Carrie all over again. He recognized the recurring theme of the tension between emerging psychic abilities and nascent sexual awareness in both novels and wondered if he might be lapsing into self-imitation, or even self-parody. When he returned to the manuscript after finishing The Dead Zone and the novella “Rita Hayworth and Shawshank Redemption,” however, he was gratified to discover that his fears weren’t justified. Not only was Firestarter better than he remembered, it was better than Carrie. He realized he was amplifying themes that were intrinsic to his work, which is something more acceptable in literary fiction than in popular fiction. He finished the final draft in the fall of 1978, after the family moved to Orrington, working during the evening while teaching creative writing at the University of Maine, his first experience teaching at the university level. The book ended as it did because King didn’t know what happened next. However, he said over the years that he had wild moments where he imagined Charlie McGee meeting Danny Torrance and they get married and move to ‘Salem’s Lot. As we now know, that didn’t happen. Maybe there are some “historical context” details that delve too deeply into King’s life, but since he has talked about this himself, I guess it’s okay to mention here. While he was working on Firestarter, he and his wife decided that three children were enough, so he had a vasectomy. The next day, he went back to work on the book, but started bleeding from his incision. His wife discovered him at the keyboard, sitting in a pool of blood, determined to finish the current paragraph before he would let her drive him to the hospital. The reviews—and two excerpts published in Omni magazine in advance of publication—translated into sales: nearly 300,000 hardcover copies in the first year alone, a significant increase compared to The Dead Zone. This was also the first King book to be published in limited edition, a 725-copy numbered edition from Phantasia Press with a striking Michael Whelan wraparound cover, and a 26-copy lettered edition bound in asbestos, which remains one of the most sought-after and valuable King limited editions. I can’t confirm or refute the popularly held belief that King coined the word “pyrokinesis” in this novel. He also talks about auto-pyrokinesis or self-immolation in interviews. Two books arose from his year in Orrington: Danse Macabre was created from his fiction course preparation and Pet Sematary was inspired by incidents that occurred during his time there, as we will see in future installments. This is apropos of absolutely nothing, but it was an interesting factoid I discovered while researching this essay. The movie rights to Firestarter were sold, pre-publication, for $1 million to “an Egyptian producer named Dotie Fyad,”—that’s how the name was rendered an the interview with David Chute. Dodi Fayed was, of course, the man who died in the car accident that claimed the life of Princess Diana. King bleeding for his work seems very apropos. Firestarter is an enjoyable book. Not at the same level of his previous efforts. Great to get the background and historical context Bev. Thanks! PS – I really do wonder what Charlie is up to these days? love the essay! is Dodi Fayed the person that bought the rights? just confused a wee bit. Nice essay. King’s fascination with fire is evident, especially in his early work in which a cataclysmic blaze figures prominently into each narrative. (Carrie, ‘Salem’s Lot, The Shining, The Stand, Firestarter, The Running Man, Pet Sematary etc.) Incidentally, I can only imagine what kind of offspring Charlie McGee and Danny Torrance would have produced . . . or maybe I don’t want to. First King book I ever read…loaned to me by a VERY cute fitness instructor on whom I had an unbearable crush! Good memories. Excellent article. Firestarter is one of my all-time favorite King works. 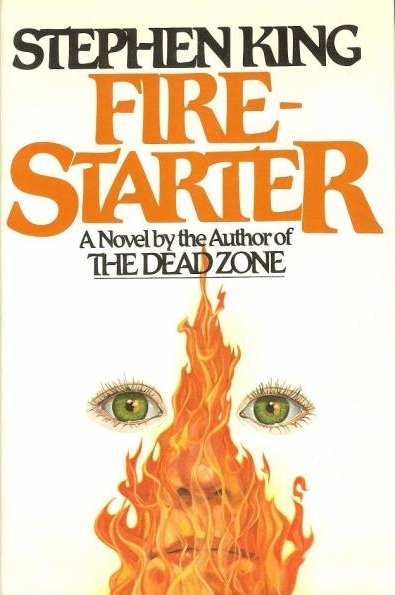 Anytime I meet someone who has never read SK, I always recommend Firestarter as the book to start with. Hooks ’em like a charm. It’s a can’t-put-the-book-down honest-to-goodness thriller! Your Historical Essays are awesome. I really learn a lot! Keep up the good work! Looking forward to IT, 11/22/63, Mr. Mercedes …. Maybe you can skip around a bit! Just read Blaze and loved that story, dont know why he locked that one up either…. As Johnny Smith would say, “Your house is on fire. You still have time to save your daughter, but you have to hurry!” Of course, you have to say that like Christopher Walken, too. Loved Christopher Walken in that movie. Wonderful Historical Essay, Bev. I always look forward to these, because I learn so much from them. Thank you.